Typical Monday which is to say the blog is more the star than the puzzle itself. Nothing intelligent to add here….not that that’s ever stopped me in the past. LAT: 6:16, no errors. CHE: 14 minutes (written), 1 error. BEQ: DNF after 35 minutes with about 95% filled in. A little bit more “medium” than his usual, but an effort I’m happy with regardless. Opened my paper this am to do the crossword..its filled in?!!!! CONGRATS! Your time of 0:00 is the best of the day! Not as easy as some Mondays. Had ashcan rather than ashBIN & had loams rather than LOESS, which I’ve never heard of. But figured it out and finished. All’s well that ends well! And what a great Super Bowl. But alas, football is over. BEQ: 23:55, no errors. Quigley rates it “hard” and I fully agree! A lot of my entries were educated guesses. After I was done, I used Google to look up fifteen or twenty things that were complete mysteries to me (WARNING: SPOILERS AHEAD! ): Nell Irvin Painter? Ryans? (Okay, maybe I had heard of “Jack Ryan”.) “FPC”? For “Federal Power Commission”? “Set It Off”? From “Descendants”? A “qui tam” lawsuit? “TGV” for “French bullet train”? “Elvin Hayes” = “Big E”? “Sportsball” as a smug putdown? “Nic Cage” digitally inserted in your favorite movie? (You can do that?) Trippie Redd? “Bosch” home appliances? (Yeah, maybe.) “Tea for the Tillerman”, by Cat Stevens? “Essie” nail polish? “GameSkip” is a company? And you can rig your Tivo to record only the Super Bowl ads and skip the game? … The mind boggles … or, at least, mine does … (but it’s easily boggled) … ? Hogs, motor bikes – I call ’em donor bikes. Around here, snowmobiles are just as bad, with how many people crashing through the ice, or into each other on a hill, or into a car as they try to speed across a highway. And just because they can go over 70 mph, doesn’t mean they gotta. Fuzzle! I like a Monday that’s a bit more challenging than usual. Had OLAF before ODIN. Like Kay, I also thought LOAMS before LOESS. @Bill ~ FWIW, cd cases are called jewel boxes because the shiny faceted plastic looks like gems or jewelry, particularly the round center that holds the CD in place. ? Dave!! Yes, a MetaSporcle!! A Sporcle is one letter that many people get wrong, and from what you say, I bet a LOT of solvers had the same mistake, getting that far but missing that final step. Excellent coinage! ? 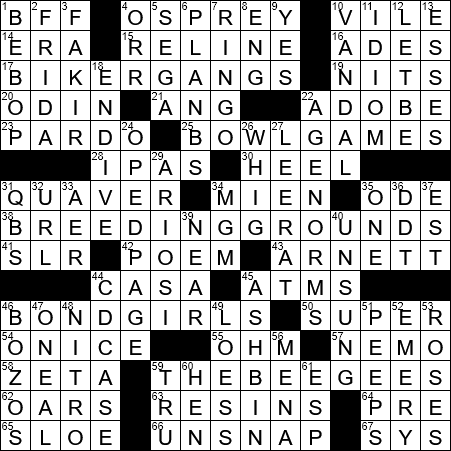 According to the WSJ crossword blog, 75 other would-be meta solvers made the same mistake I did. So I feel a little better … I think … ?.